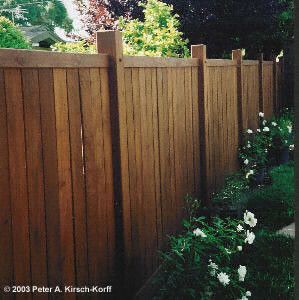 Once your wood deck, fence, gate or pergola is built, you need to protect the wood from weathering and aging. Most homeowners choose to apply either stain or paint to ensure the project has a long life. Staining lets you see the wood grain and preserve or alter the color of the wood, while paint hides both the grain and color. If you choose to use a stain, I recommend using one based on linseed oil that comes in a solid or semi transparent form. The linseed oil supplements and replaces the wood's own naturally protective oils. A linseed oil based stain should first be applied a few weeks after the project is completed and then, ideally, once a year. Below are some of my recommendations for products as well as tips for getting a great finish. It is very important that you follow precisely all the directions on the cans. So read the label carefully and follow the specific instructions for the stain you are using. These stains come in different colors. I usually use the Semi Transparent Redwood because it gives a rich redwood tone and lets the wood grain show through. Penofin is available at Stock Building Supplies (formerly Terry Lumber yards with 14 locations throughout Southern California). Several of my clients have been very pleased with Cabot Deck Stains which are available at better paint stores (such as Spectra Paints in Pasadena). These stains come in a wide variety of colors in both semi transparent and solid coverage. Let your newly built wood structure "season" at least 3 weeks before you apply a stain, fill holes or cracks and paint it . This gives the wood time to "settle" into your environment, adjust to the stresses it now bears and open up its pores to absorb the stain better. Make sure the wood is completely dry before you stain it. Do not apply anytime there is dew on the ground or the wood. And if it has recently rained, I suggest waiting at least 2 weeks to let the wood completely dry again. Do not apply any stain in direct sunlight. I recommend applying it either in the morning or late afternoon, or on a hazy or cloudy day. Stains can be applied by brush, roller, sponge or sprayer. Once the majority of the stain has been absorbed, rags, sponges and dry brushes are used to wipe off the excess. I recommend using a brush if you want the best looking finish and are willing to invest a bit more time in applying the stain. A good grout sponge is a great way to quickly apply stain to wood that has a smooth surface (such as Mangaris™ or planed Redwood). You can also use a paint roller for staining large areas -- but you need to use the appropriate cover. 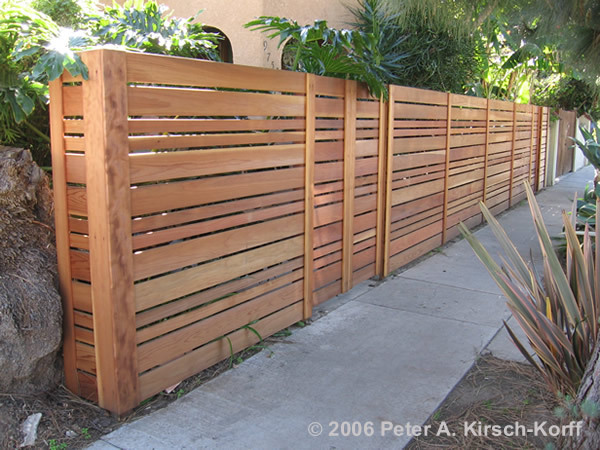 Use a rough surface cover on rough wood surfaces like cedar fencing and a smooth cover for Mangaris™ and planed Redwood. If the roller leaves a nappy finish, smooth it out with a brush right after you roll it. For staining large projects, especially fences, I recommend buying an inexpensive ($20-$30) deck sprayer (the type you pump up before you spray). It must be a deck sprayer. A lawn sprayer, which looks similar will not work because it does not have the right pressure and spray tips. You can buy one in a Do-it-Yourself store or a good lumber yard. If you are using a deck sprayer, it is important that the stain be thoroughly mixed. I recommend you get the store to mix all your cans in the mechanical mixer. It is critical that you use a disposable paint filter when you are pouring the stain into the sprayer. This will keep the nozzle from clogging. If you don't strain it, the nozzle will clog often and it's a mess to clean. I also recommend wearing a mask when spraying because the stain usually tastes and smells unpleasant for several hours afterwards if you do not use the mask. When applying the stain, avoid spraying it on nearby plants, surfaces and the neighbors yard. To catch the over spray, place a couple of cardboard spray shields behind or under the wood. Inexpensive shields can be purchased where you buy the stain. If you are very concerned about over spray (such as on the edge of a pool deck), I recommend staining the edges first with a brush and then using the sprayer for the big center areas. It is important to wipe off the excess stain which sometimes remains on the surface because the wood has absorbed all it can. If not wiped off, the excess will dry and leave a sticky surface. If you happen to end up with a sticky surface, you can try using paint thinner to rub it out. But test it first on a small inconspicuous patch of wood to see that it does not change the color of the stain or the wood. If you are doing a large surface, make sure you can wipe down all of the surface you have treated before you start another area. Soak all used rags, sponges and brushes in water before you throw them out. I recommend dropping each one into a bucket of water right after you use it and leaving them there until the morning you put the trash out to be hauled away. This is very important because linseed oil soaked rags can "spontaneously" combust and start a fire unless they are soaked with water. 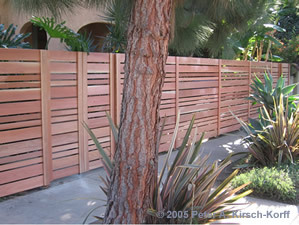 Before (left) and after (right) staining photos of a modern style horizontal redwood fence. If you are looking for more ideas and information, check out the California Redwood Association's finish tips.